The Arizona Trail (AZT) is definitely one of the lesser hiked trails and in most cases is hiked in early spring or late winter, from south to north. I will be hiking in early fall, north (Utah) to south (Mexico). This complicates things because the guide books, water report and trail notes are all written for the opposite direction, six months earlier in the season. But wait, there's more! Hiking in fall means fewer hikers on the trail and a slimmer margin for error. Rather than relying on hikers ahead of me to report whether springs or streams are running, I'll have to wing it and assume only the most reliable sources are running, ask locals and carry extra water. Not only that, the trail is broken up into passages, small pieces that make exploring sections much easier than on the PCT. 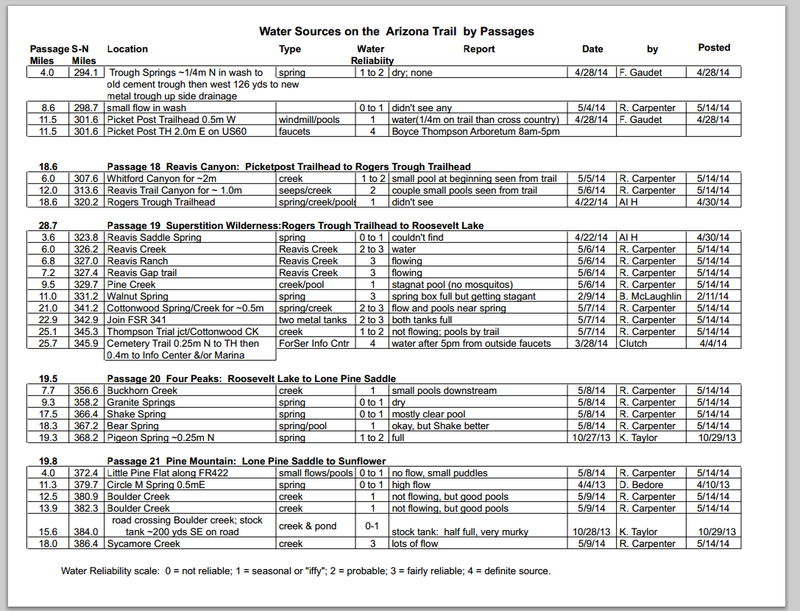 This is great for day users and section hikers/bikers but makes it a little difficult for me as a through hiker since there are 43 passages to keep track of - each with their own lists of data! So how do you plan for such a badly timed, backwards facing hike? Well it's not really that badly timed; Utah and parts of Arizona have a monsoon season of sorts through August and into September. Depending on the year that will help the water situation. Water sources are listed along the trail and rated by reliability, but these ratings seem to be largely based on spring, not fall conditions. There are some caches along the route but they are even less reliable than the PCT. The worse case scenario is renting a car for a day and caching water along the route. If needed, I would probably do this in two steps, one before starting and one midway through. 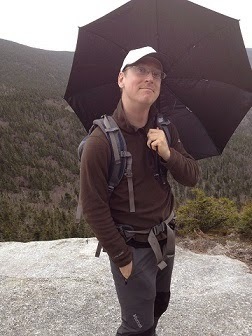 Ideally it won't be necessary, and it wasn't for one of the hikers whose blog I've been reading - Buck30. The key will be keeping an eye on this years monsoon season and following the updates to Fred Gaudet's wonderful water report. Even though I'll likely be the only southbound through hiker, hopefully the day and section users of the trail will send in some information ahead of me. Not only that, but as of May it was expected to be a rainier than average monsoon season in Utah and Arizona according to NOAA - that great predictor of through hiker fates. Everything is organized by South to North miles, I'll be going North to South, which means lots of math in my head. This section looks pretty good with even unreliable water mostly every 10 miles or less. 20 mile dry stretches will be ok as long as the heat stays low. To carry it I'll have three 1L "smart" water bottles and a 2.5L platypus bag. The bag is lighter than the bottles but having four containers makes for a good backup if the bag or any of the bottles leak. For filtering and purifying I'll be using a sawyer squeeze in conjunction with the bottles. Simply fill the bottles with dirty water and swap the cap for the sawyer and squeeze away. The smart water bottles are more reliable than the squeeze. I'll also take Aquamira as backup and for really gross looking water. Hot weather and climby (lots of elevation) - SIESTA! It served me well on the PCT with some night hiking thrown in. The key is to know when to Siesta and not worry about time so much. The worst is when it gets so hot you sweat in the shade, resting. That is scary hot. That about does it for water, check back next week on how I'll be planning food for the AZT.